UK airports operator BAA has said that last month's terror alert cost it £13m in increased security measures and lost revenues from cancelled flights. The firm, which runs seven UK airports including Heathrow, also said passenger numbers rose just 0.3% in August compared with the same month last year. BAA said fewer than 2% of flights were cancelled last month after an alleged plot to blow up planes was discovered. August's 0.3% rise in passengers comes after a 3.1% jump in July. News of the alleged plot to blow up flights from the UK to North America first broke on 10 August. A total of 17 people have since been charged in connection to the alleged conspiracy and remain in custody awaiting trial. The heightened security measures led to several flight cancellations and travel disruption for several days. British Airways has already said that the disruption cost it £40m, while the delays cost budget carrier Easyjet £4m. 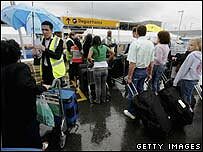 BAA said 14.3 million passengers used its UK airports during August. Across its individual airports, three saw a fall in passenger numbers against the same month last year - Heathrow, Glasgow and Edinburgh. The number of passengers passing through Heathrow and Glasgow both declined by 2.2%, while those at Edinburgh fell by 1.3%. Meanwhile, numbers increased at Gatwick by 2.1%, at Stansted by 4.9%, at Southampton by 1%, and at Aberdeen by a strong 8.1%. The market most affected by the terror alert was flights within the UK, which saw passenger numbers down 7.6%, and North Atlantic traffic, which fell 3.3%.